Ok, this weather has been playing with us but I’m here for it!! It was almost 70 degrees today and I was hype! I was just in LA and it was cooler there than it is on the east coast. 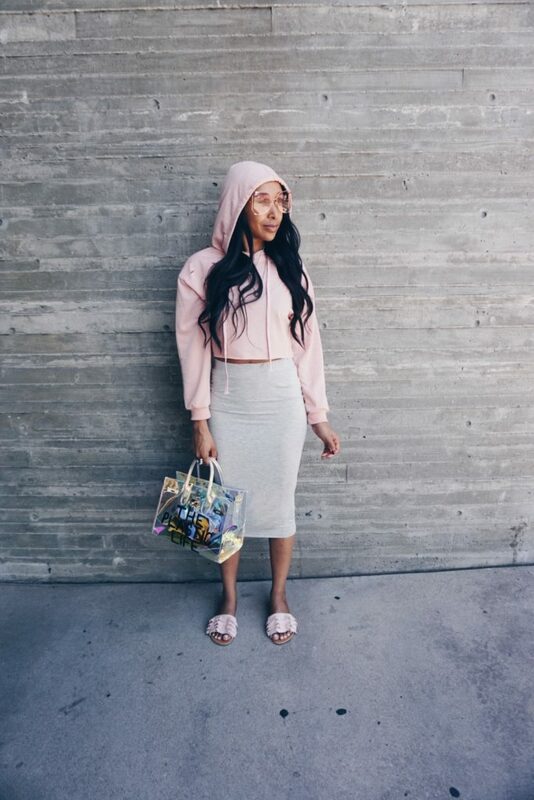 I brought a cute but chill SHEIN outfit with me that I loved. I told you all about this brand before and how they have sooo many items to choose from ranging from casual to glam and they are super affordable. It is a one stop shop for trendy affordable clothes. Trends come and go every year. What’s in this summer may not be in next summer and keeping up with trends each year can be expensive. 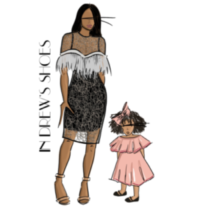 So when it comes to trendy pieces, I know some of my readers would rather spend $10 at Shein than $50 or more somewhere else. As you all know, I like to mix highs and lows. 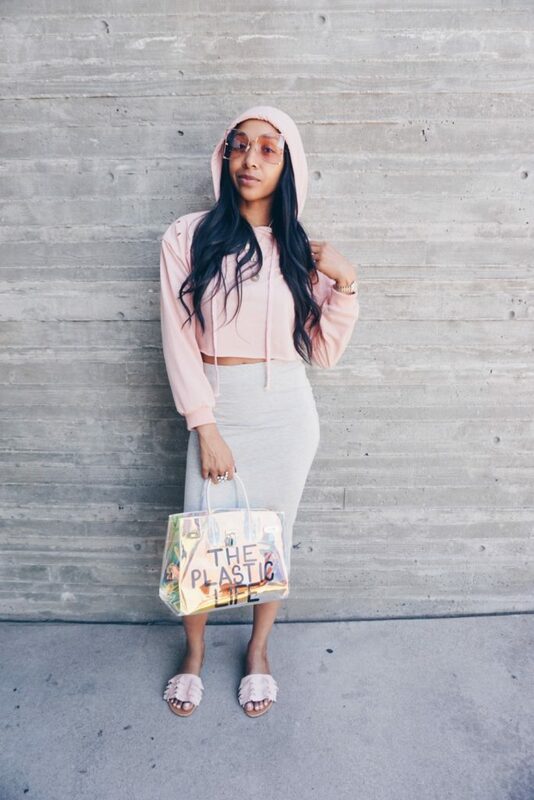 See below how I paired my $8 Shein Elastic Waist Midi Pencil Skirt and my $9 Drop Shoulder Raw Hem Rips Crop Hoodie with my Sonique Saturday bag and pink Gucci oversized round frame metal glasses. This midi hoodie has little cuts on the shoulder that give it a nice edgy look.The top is super soft, fits nicely and is true to size. The skirt fits like a glove and shows off your curves for sure. You see my little curves poking through LOL!! This is a perfect outfit to run errands in but still look cute while doing so. 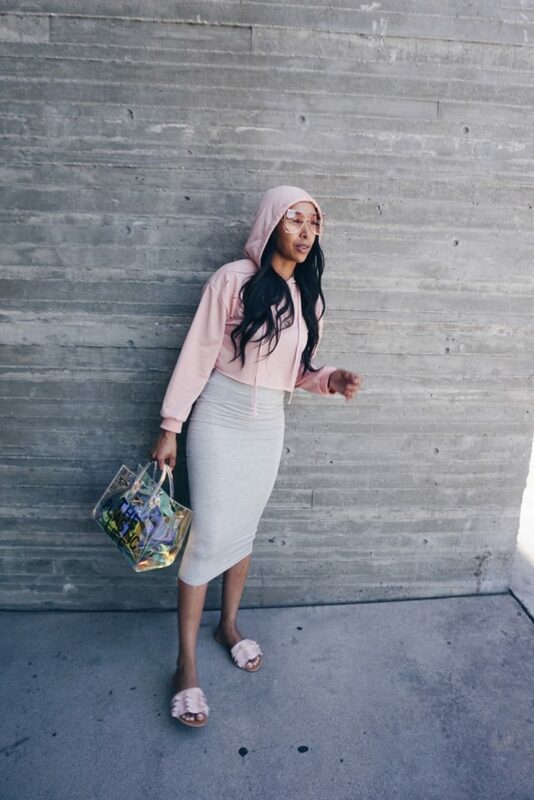 Click here to check out the Drop Shoulder Raw Hem Rips Crop Hoodie, Shein Elastic Waist Midi Pencil Skirt and more! Super cute love the bag!